Abstract: Julia is a new language for mathematical computing that promises to have the ease of use as a high level language, while having the speed and performance of a low level language. This combination has excited developers from academia to industry, and created a large and thriving ecosystem of hundreds of thousands of users, thousands of contributors, and over 1500 packages. This workshop will introduce the audience to the power and beauty of the Julia programming language. We will introduce the language and its basic syntax, efficient development setup, the type system and multiple dispatch. We will see how to analyse the performance of Julia programs, and enable the maximum possible performance from the hardware. Finally, we discuss the typical data scientist workflow, and see the tools and packages that enable this, from data loading and querying mechanisms, to statistical and optimisation libraries, and visualisation tools. We will end with pointers to AI ecosystem in Julia. 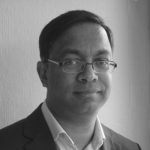 Bio: Avik Sengupta has worked on risk and trading systems in investment banking for many years, mostly using Java interspersed with snippets of the exotic R and K languages. This experience left him wondering whether there were better things out there. Avik's quest came to a happy conclusion with the appearance of Julia in 2012. He has been happily coding in Julia and contributing to it ever since.